As the clock strikes Twelve – New Years tradition is to gather with friends and family to wish them well – sing a song and exchange an embrace. We’ve all heard the song and probably sung it – most of us badly – at least I have. It is believed Robert Burns wrote the lyrics to Auld Lang Syne in the 1700’s. (Most say in 1788.) The 1700’s were challenging years for the Scots – and in January of 1788 – it was the passing of an era with the death at 68 of the long exiled Bonnie Prince Charlie. This video has Auld Lang Syne as sung by Dougie MacLean on his album Tribute. As we sing Auld Lang Syne to this challenging decade of zero years, let’s take a page from from the song and put it behind us with fond memories of what was good and focus in on where and why we might raise our ‘cup of kindness’ to the decade to come. The decade of the Big Zero was not all bad – it had it’s highs and it’s lows. But the highs for me included starting my own company (CorePurpose turns 8 in July), publishing my first book, leading an inspiring team at ASBA for two years, working with the team at Parenting Arizona and OTEF to make a lasting difference in our community, helping RiboMed move forward in it’s quest for new methods of early cancer detection so we can catch it early and stop the spread before it harms the ones we love, and watching my sons grow from boys into men that their Dad and I can be very proud if. All in all, not a bad list. As I look towards 2010 and beyond – let’s call it the Decade of the BIG ONE – I’m starting a To Do List – not resolutions to break – just actions to take. Help someone find a job they love. Pick an OLD Problem and Solve at it in a NEW way at least every other day. Accomplish ‘Small Things” as suggested by Rebel Brown in this post at Phoenix Rising. Zero in on finding my QUEST company and get it growing. So, there you have it – my Look Back List and my To Do List going forward. Have you started yours? Thanks for stopping – best wishes for a Safe and Happy New Years and a record breaking 2010 and beyond. Get ready – this decade will be the BIG ONE. I first met Michael Gerber in November of 2006 when he generously gave of his time and knowledge to come to Phoenix as a volunteer to speak at the First Annual Arizona Entrepreneurship Conference. OTEF was a fledgling organization in those days – but we had a dream – to provide entrepreneurial education, mentoring, and support to at risk populations in finding economic sustainability through entrepreneurship. To do that we needed the funds to offer programs and the conference was a way to share our message and raise the funds to pursue the dream. Our project captured Michael’s imagination. Since that day, we’ve had the opportunity to get to know each other better. During my years as CEO at the ASBA, Michael was a wonderful supporter, sharing his knowledge on teleconferences with our members, coming, with his wife Luz Delia, to share in the celebration of the 2007 Arizona Companies to Watch, sharing ideas with me and our small business community at the Enterprise Business Conference in 2008 to celebrate Small Business Week, and best of all inviting me to The Dreaming Room and plopping me down in the Hot Seat for a challenging one on one session. Over the years he has had many titles – but my favorite – is Chief Dreamer. When you get to know him, you see how important the dream is to him and to the tens of thousands of entrepreneurs he has worked with. In the video below from the Cisco Innovators Forum, Michael shares some of his thoughts on how entrepreneurs can get it right from the beginning. 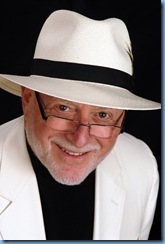 After the video – I have a few questions of my own to ask the one and only Michael Gerber. JKW: Michael, in your books, seminars, and programs, you share the secrets of entrepreneurial success. You have spent decades sharing these secrets – WHY do you do it? MG: What else would I do? Everywhere I look, people are suffering for a lack of direction. During my life I have worked with thousands of those people, and as they begin to see their lives through the entrepreneurial prism dramatic shifts occur. It’s a fantastic feeling to witness those shifts. JKW: You have made a career helping entrepreneurs succeed in achieving their dreams. Have you always been successful or was there a time when something happened that others would term an entrepreneurial failure? If so, how did you recover? MG: I’ve had so many failures I can’t count them. In fact, I don’t even want to, the pain is too great. But, at the same time, my failures have always led to successes. Not necessarily connected, perhaps, but the one, the failure, taught the other, the success, that the deliberate straightforward path is not always the best path, that the success is most often realized as an epiphany that arises out of the failure in a completely unexpected fashion. So, I have come to look forward to the unexpected. JKW: You have written over 13 books for entrepreneurs and you have a new one being released in January 2010. Can you give us a little sneak peak at what it’s all about? 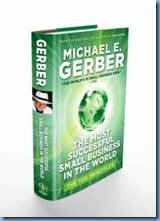 MG: It’s name is The Most Successful Small Business In The World: The Ten Principles. It speaks to the essence of what I believe must exist in an enterprise, and an entrepreneur’s relationship with it, for it to truly flourish. You’ll have to read it to find out the secret. JKW: When you are not writing, speaking, and inspiring others, I know that you like to read – a lot. Whose book inspires you – and why? MG: I read fiction, not business. I rarely read anything to do with business. The reason is, I don’t learn from books, I learn from action. On the other hand, I highly recommend that all small business owners and entrepreneurs read my books. Because unlike all other business books, my books are born out of the actions I’ve taken, and the conclusions I’ve reached as a result of those actions. In short, they are less books, than they are cautionary tales. JKW: You and I have talked about social media, blogs, Facebook, and Twitter as it has been evolving. So Michael, do you tweet? MG: Not yet, but soon. JKW: I’ve heard that this year, as a special gift, you are hosting a FREE con call on New Year’s Day with entrepreneurs to help them kick the year off right. How can our readers participate? It starts at 4 p.m. PST and will last 90 minutes. 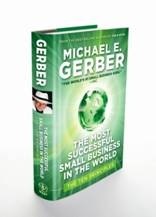 I do this every year, but this year is special, as my new book comes out on January 6th, and during my Teleconference I’ll be sharing The Ten Principles for creating the most successful small business in the world. JKW: Thanks so much Michael for taking the time to answer a few questions. As you know, I always have more. I guess I’ll just write them down and heave them ready for when I see you in Phoenix for a Meet Up on January 25th. (Readers: Stay tuned to @joankw for more details in January.) Who knows – maybe some of our readers will be there too and have new questions for both of us. So readers, what do YOU think. Are you ready to kick off the new year right? I’ll be on the call – will you? Entrepreneurs are dreamers, creators, innovators, and builders. They come in all shapes and sizes, and have businesses that run the gamut from global ventures and high technology to localized products and services. But if there is one thing that entrepreneurs have in common, it is their generosity and willingness to help others. It’s probably because entrepreneurs understand what it means to strive, to struggle, and to work towards a dream. Every year for the past 5 years as Chairman of OTEF , I have watched as entrepreneurs from Arizona and across North America gather at the Arizona Entrepreneurship Conferences to learn from each other AND to help OTEF, the Opportunity Through Entrepreneurship Foundation, raise the money need to fund programs that help at risk populations realize economic self sufficiency through entrepreneurship with classes, mentoring, and other resources. To learn more about OTEF and it’s programs – click here . But even after the ‘show’ is over, the continuous challenge of funding these activities continues. This week, we got yet another example of the generosity of entrepreneurs when the team at Pillsbury Wine Company, reached out with a wonderful offer to help in furthering our mission. 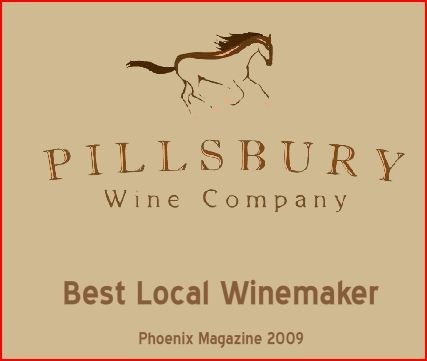 Pillsbury Wine Company is the brainchild of Sam Pillsbury, award-winning New Zealand and American film-maker (The Quiet Earth, Free Willy 3, Endless Bummer) and former co-owner of Dos Cabezas winery in Southeastern Arizona. Wine is his passion and Sam has done it all- from planting vines to serving Dos Cabezas wines at the White House. Dos Cabezas wines have received stellar reviews over the years and Sam is now ready to take his skills and experience in a new direction. Sam is joined in the project by winemaker Eric Glomski, formerly with David Bruce and Caymus wineries in California and by Rob Dunaway, attorney/businessman, voted one of Phoenix’s top 12 business advisors in the New Times 2001 Readers Poll.Rob, also a founding member of OTEF’s board of directors, brought us a special opportunity and now I am sharing it with you. It is the opportunity to support the Opportunity Through Entrepreneurship Foundation this holiday season with a gift of wine to yourself, to a loved one, or for a valued business associate. In return, PILLSBURY WINE COMPANY, the hot Arizona Wine Company that critics are raving about, is donating 12% of the wine sales to OTEF.It’s really easy – just email LindseyHigginson@aol.com and let her know which and how many of the AWARD WINNING, FOOD ENHANCING RHONE VALLEY STYLE WINES Pillsbury has to offer you would like to order plus your contact information so Lindsey can get back to you and “This is for OTEF” to trigger the donation!Bottles signed by Sam Pillsbury can also be arranged.See this really is a great opportunity. In one fell swoop, you get to help OTEF teach entrepreneurship skills to at risk groups as well as present great programs like AZEC09, plus you get access to wonderful, award winning wines, AND if you have not finished your holiday shopping – here’s your chance. For your shopping pleasure – here is the list of wonderful Pillsbury wines…Pillsbury 2008 Rosé $20Provençal style ‘onion skin’ pink with hints of watermelon, red cherry and strawberry on the nose, bright and refreshing in the mouth, with a clean finish. It will pair well with any light fare, especially salads, fresh fruit, and cheese and crackers. 94 Cases made. Alcohol 14%.‘Local Product of the Month’ Phoenix Magazine, August 2009.Pillsbury 2008 Pinot Gris ‘Casa Blanca’ $20We call this ‘Casa Blanca’ because the Pinot Gris made from these high altitude Arizona vines have twice been served at White House State Dinners. It has a nose of freshly chopped apple, followed by ripe peaches and apricots on the palate. It pairs well with salads, seafood or lighter chicken dishes. 230 Cases made. Alcohol 12.5%. Not yet rated.Pillsbury 2006 Roan Red $24A blend of Grenache and Mourvedre with a small amount of Syrah and Petite Sirah, aged in neutral oak. Bone dry, unfined and unfiltered. Fragrant herbal nose with hints of lavender and honeysuckle. It has spicy ripe red-cherry fruit, with hints of vanilla and tarragon and an autumnal, forest-floor character, with a lovely long finish. Pair with pastas and lighter meat and poultry dishes. Alcohol 13.7%, 329 cases made.93 points. 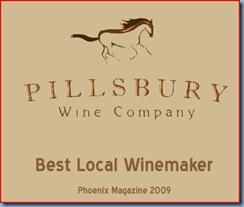 Mark Tarbell, AZ Republic (highest score ever given an AZ wine)Pillsbury 2007 Roan Red $2493.2% Syrah, 6.8%Grenache. This Roan Red is different than the 2006. Our Syrah vines are an Aussie Shiraz clone we planted in the Arizona High Desert in 2000. This is an intense wine with a spicy nose, cherry/cranberry and dark berry fruit with silky tannins and hints of sweet walnut, cucumber and blood orange. Pair with lamb, pasta or robustly flavored chicken dishes. 186 cases made. Alcohol 14%. Not yet rated.Pillsbury 2007 Diva $3664.3 % Grenache, 21.4% Petite Sirah, 14.3% Mourvedre. This blend is a Chateuneuf du Pape style blend, and once again made with our ripest fruit and matured for 15 months in neutral American and new French oak. A fragrant wine with suggestions of super-ripe wild strawberry, macadamias, tobacco and bitter-sweet chocolate with ample tannins, making it perfect for steak or barbeque and big rich casseroles. 173 cases made. Alcohol 14.5%.Gold Medal, 2009 Arizona Wine Growers Association Competition. 2006 Diva called Best Wine in AZ by San Francisco Examiner and Wine Spectator gave it 89 points.Pillsbury 2007 Petite Sirah. $54This monster Petite Sirah was picked late at 28 brix and develops an intense, almost chewy chocolate-like quality and some real fruit complexity. We tend to avoid late-pick reds as the overripe fruit and high alcohol tends to obscure the complexity of the fruit, but Petite Sirah seems to come into its own when made like this. It is bone dry, has hints of intense black berry fruit, roasted cocoa, green apple, sweet blueberry, crème brulée and rose petal with big tannins. 30 cases made. Alcohol 15.4%. Glorious wines from Generous People coming together to make life better for others. Like I started off saying – entrepreneurs are some of the most generous people I know. How did it get to be NOVEMBER already! It seems like just the other day I was writing articles about Embracing Change in 2009 and now, in just two short months, 2009 will be one for the record books. It’s still to be written what the final outcome of the health care debates in Congress will be, or how the year will wrap up from an economic perspective, but many will tell you they can’t wait for 2010 to make its arrival. But there have been some bright spots in this recession that we have all struggled through. Companies that are making great things happen in the world of social media, women’s health, green materials, and a host of other industries. That’s why, as I prepare for the exciting things that I know will happen in 2010, I am getting ready today by attending the 4th Annual Arizona Entrepreneurship Conference on November 12th. As chairman of the board of OTEF, the Opportunity Through Entrepreneurship Foundation, November is always a busy time as we prepare for the conference. Each year’s conference is vitally important since all of the proceeds go to fund OTEF’s efforts to provide entrepreneurial training and support to at-risk populations – giving them a better chance for future financial sustainability. But, as an entrepreneur, I look forward to the conference for the many great ideas I know I will receive there each year. This is the only place I know where, in one day, I can gain insights from national thought leaders like Tara Hunt and Michelle Robson (EmpowHer) , connect with fellow CEOs from TiE and EO to learn what’s working for them, and get the latest updates in technology and business trends from CEOs and thought leaders who are on the front lines. I’m also excited this year that we have friends coming from far and near to share ideas. Patti Dragland (@StrategicSense) is coming in from Calgary, Tara Hunt (@MissRogue), author of The Whuffie Factor, from Montreal, Howard Lindzon (founder of StockTwits), Kevin Surace, of Serious Materials, is flying in from Sunnyvale, and my favorite entrepreneurial blogger, Marty Willing (@StartUpPro), will be there not to mention fellow conference team members and great friends like Francine Hardaway (@Hardaway), Steven Groves (@StevenGroves), Ed Nusbaum (@EdAZ), Merlin Ward (@MerlinWard) and many more! November 12th is an important day for gathering new ideas, making connections, and to just get that extra dose of inspiration that will come in real handy in 2010. I know where I will be on November 12th. How about you? It’s May Day today (May1, 2009). In different cultures and different places, May Day has different meanings, but interestingly in one way or the other they link to a common theme. In each face of May Day we see people coming together. When I write these weekly wrap up blogs, I often add a song or video so you can listen along. This one – Stand By Me by Playing for Change is a favorite of mine – I hope you enjoy it as you read on. For some, May Day is the celebration of Spring, with communities coming together to celebrate Spring in all its glory. It is a time to look toward the future – to celebrate growth and new life. In come countries, May Day is Labor Day or Labour Day while here in the United States, we celebrate it at the end of the month. Around the world, May Day gatherings have not always been just joyous gathering and picnics. May Day has long been a day of often marked worker protests, rallies for change, and calls for equality. May Day became a significant rallying call for the Socialist Parties in many countries and in many cities around the U.S. this year there are gatherings about immigrant rights and issues. May Day is also the internationally known distress call. Not tied to May 1st, it’s origins come from the French phrase m’aidez which translated means ‘help me’. Only used in times of serious distress or danger, May Day calls are monitored 24/7 (on VHF channel 16, or HF 2182.0 KHz) so that help can be sent when needed. OTEF – The Opportunity Through Entrepreneurship Foundation – launched Blueprint for Survival to help displaced workers through entrepreneurship skills. New Global Citizens is teaching young people how to “be the change they see in the world” (Ghandi) while Playing for Change is is a multimedia movement created to inspire, connect, and bring peace to the world through music. SARRC reaches out to offer support and solutions to a growing population of families touched by autism. AACR recently held it’s 100th Annual Meeting of Cancer Researchers where people from all over the world shared ideas and innovations. RiboMed is imagining (and working towards) a future when getting a noninvasive, multi-disease diagnostic test at your annual medical exam is as routine as having your temperature or blood pressure taken. Imagine tests that can detect early biomarkers of cancer, Alzheimer’s, diabetes, autism or heart disease long before symptoms present. Imagine that when disease is detected, doctors can prescribe a treatment plan designed specifically for you. In spite of all the challenges we face, for me this May Day means Hope. You see, when people come together to build solutions, magic happens. Please leave a comment and share ways you have found or seen where people are coming together and making a difference. Leave your mark this May Day!